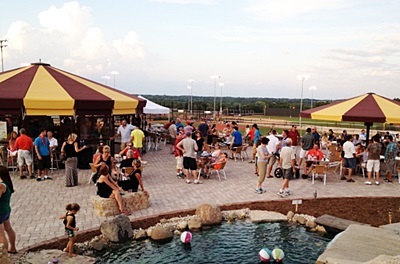 The Umbrella Bar is the best outdoor sports bar in Franklin, WI, and the first venue of its kind in the Midwest. Featuring a tent-like structure with a large satellite umbrella ceiling, our outdoor bar in Milwaukee is the go-to destination for the 21 and older crowd! Relish the breath-taking view of the city, watch a ball game on the Major League replica baseball fields below, or simply soak up some rays on the outdoor patio. There's tables, couches, even a double-sided fireplace for those chilly evenings! Your favorite drinks, a spectacular 360 degree view of The Rock Sports Complex, and your choice of indoor or outdoor seating? What more could you ask for? Milwaukee's Best Bloody Marys, Long Islands, and Beer - Oh My! The Umbrella Bar offers a fantastic selection of delicious drinks including beers on tap and the best bloody Marys in Milwaukee made from scratch! Grab an ice cold drink, kick back, relax and enjoy the view. *The Umbrella Bar is now open! Contact the best sports bar in Milwaukee with outdoor seating for more information.